Our Jacaranda Lotus stands in the guitars’ world just like our bass Proxima De Sensi does in basses’ one. 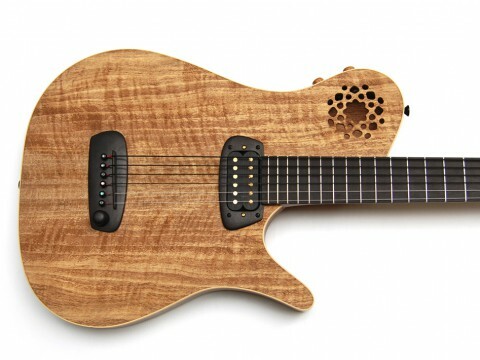 Both are hollow-body instruments, eclectic, agile, lightweight, intriguing. 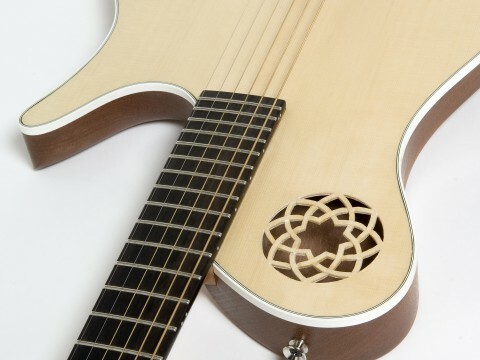 The Lotus is perfect for a multitude of genres: from jazz to fusion, from gypsy to flat-picking and fingerpicking. Our Lotus has a kind and sophisticated spirit. 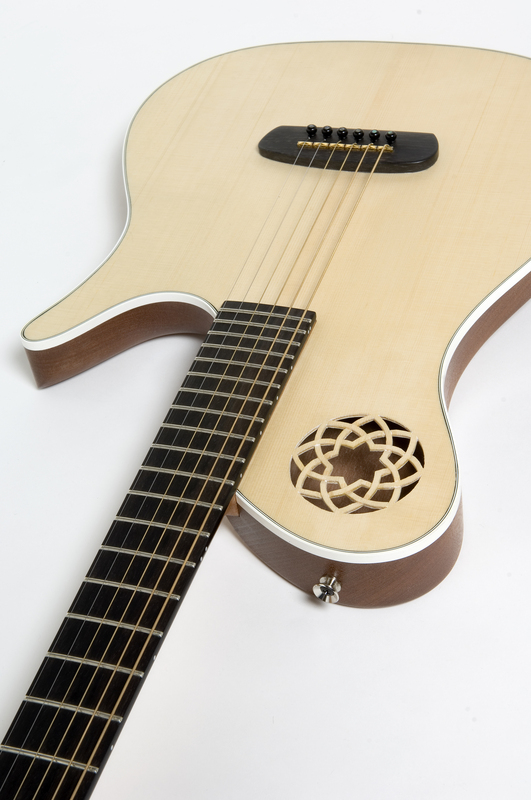 We wanted it to be minimal and elegant, but also recognizable and unique, thanks to its ergonomic design and the asymmetric hand-carved sound hole. A distinctive sign that inspired us and that we hope could be inspiring musicians in search of an electro-acoustic instrument capable of infinite nuances. The body is made of mahogany, carved and closed by a top that has been chosen exactly has one should do for an acoustic instrument, i.e. evaluating its harmonic character and qualities. 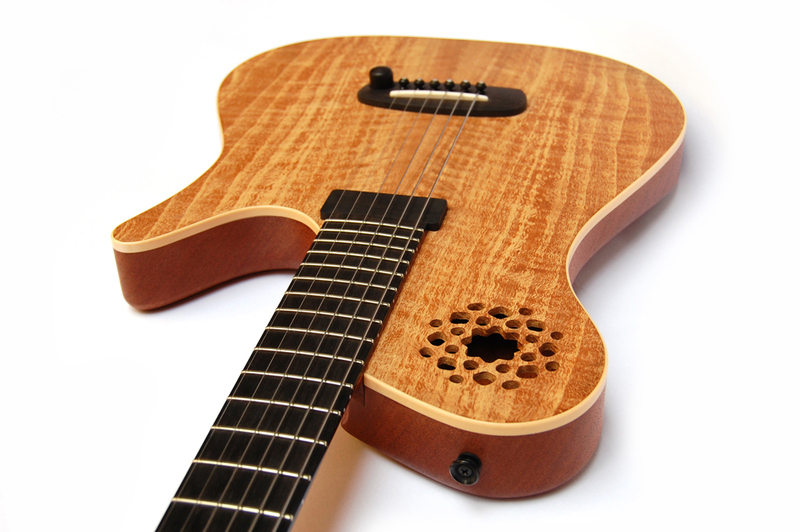 The hand-carved sound hole is on the shoulder, so to give space to the magnetic pickup, only 7 mm thick, fixed on the top. The neck, in kaya mahogany just like the body, is bolt on to the body with the very same system that characterize our instruments and that allows a perfect transmission of vibrations, beside giving an easy access to all the 24 frets. 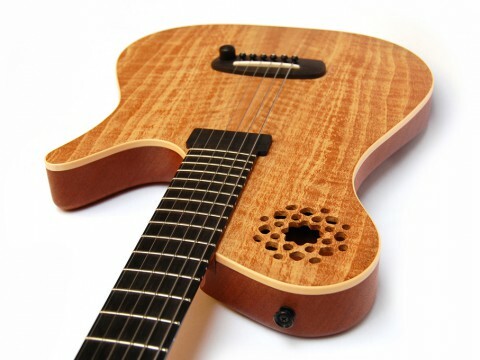 Some unique details – as the bridge that accommodate the control of pickups balance, the lotus flower inspired design of sound hole and the cover of magnetic pickup made in wood – give to the Jacaranda Lotus an extra touch.